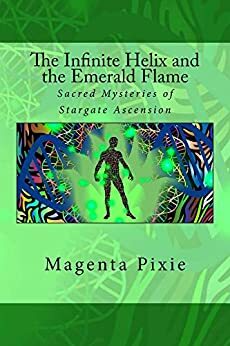 In this channelled transmission, Magenta Pixie enters into an expansive, transformative and activating exploration of interdimensional dialogue discussing the mechanics of stargate ascension. This cutting edge information holds keycodes, maps and coordinates for the 'starseeds on Earth' as they go through this process of DNA reconstruction and regrouping of 'cosmic memory' themselves. The significant codex of information is downloaded to the reader as they, through this sacred text, are called by the Dragon, Excalibur, Krystalline Light Geometry, Atlantis and the Emerald Flame. Magenta Pixie is a channel for the higher dimensional, divine intelligence known as 'The White Winged Collective Consciousness of Nine'. The transmissions she receives from 'The Nine' have reached thousands of people worldwide via the extensive video collection on her YouTube channel. She has worked with people from all over the world as an intuitive consultant and ascension/consciousness coach. Magenta lives in the New Forest, UK. Magenta Pixie is also the author of "Masters of the Matrix" and "Divine Architecture and the Starseed Template"
5.0 out of 5 starsFantasy or Real? Depends on where you are 'at' as to whether this terrific read impacts where you are 'at'. Sounds like double-speak but not to those who get it. I loved this book by Magenta which she value adds to with her Youtube videos, FB page, and occasional FB live. Enjoy the dragon ride. This book is both complex and relevant. Perfect for where we are all heading towards. I strongly recommend this book for anyone on the ascension path. 5.0 out of 5 starsGet ready! Most powerful of the 3 books. Loved the first two books and have re- read them many times. THIS one is literally Galactic. About every 30-40 pages I must take a nap to integrate, haha. Thank you, Magenta/Nine! I loved this book! It is essential for any Starseed on their path to enlightenment. This book Is a wonderful gift to accelerate the sovereignty of this planet and all of it's inhabitants! I recommend that you read "Masters of the Matrix" and "Divine Architecture" first as they contain valuable tools for your own empowerment. 5.0 out of 5 starsDon't become paralyzed by analysis...just ALLOW. Every chapter becomes an "oh, god" moment for me! The answers asked of the White Winged Collective Consciousness of Nine (channeled through Magenta Pixie) are profound! But if you are not familiar with Magenta's work, one must read her 1st 2 books in order to create one's own matrix. Then this book becomes the icing on the cake. I enjoy reading the content of the books of this author if only to be open minded and gain a different perspective on reality. As always, I caution any reader to practice DISCERNMENT as we live in a constant sea of distortion. 5.0 out of 5 starsPowerfully activating. Love this book. Highly recommended. Powerfully activating. Love this book. Highly recommend if you are interested in raising your frequency/vibration and interested in Ascension.